Touch real sea creatures and come closer than ever to giant sharks, sea turtles, jellyfish and more! Conveniently located just across the street from the Mall of America and 10 minutes from the Minneapolis airport, this hotel is in a great location! 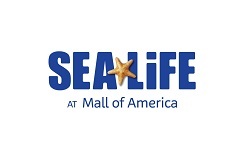 The Mall of America is a quick five-minute walk using the walkway located just across the street from the hotel. The hotel does offer a complimentary shuttle service to and from the mall at the top of the hour every two hours from 10:00 a.m. to 10:00 p.m. Two restaurants are attached to the hotel by hallway—TGIFriday's and a 24-hour IHOP (International House of Pancakes). The hotel has two pools and two whirlpools open until 11:00 p.m. for kids and until midnight for adults. Package amenities are only for one night when booking a multiple night stay. Extra nights are available without amenities. This offer is not available with any other coupons or discounts.